~March 29 2019 – Facebook live message! A Thanksgiving video message from me to everyone. For many of us it’s getting through our hardships and the tough times that make us stronger, leading us to deep gratitude! After a devastating ALS diagnosis, former NFL player Tim Green cries “tears of joy”and calls himself “fortunate,” echoing Lou Gehrig’s farewell speech. I just finished watching the incredible story of strength and courage being fought by man named Tim Green. I remember Tim Green from his football playing days in the NFL. He was a force to be reckoned with. Since then he became an accomplished author, lawyer, youth coach and most of all a proud Family man above all. The 60 Minutes special that aired tonight; covering his journey and his battle against ALS really hit home for me. Seeing his son side-by-side with him just made me lose it. Family, and the attitude of everyone in the family pulling together as one with the mantra: Never ever give up! – this is what drives me to keep battling on. ALS does not get very much national television exposure, in fact it gets very little at all. While it’s a tough subject to talk about or hear about… I’ve come to realize that our battle must be shared and awareness spread throughout the world through any means possible. Initially hesitant to speak about his diagnosis, Green has now dedicated himself to raising awareness of and funding for ALS. In an emotional interview with Kroft, Green began to cry. But he told Kroft they were “tears of joy.” “I don’t know anyone more fortunate and blessed than me—even with this,” Green said. My heart, my partner…the worlds best caregiver! When I learned I had ALS, my whole world changed, because on that day, I officially became an ALS patient. Lauren’s world changed as well because, just as suddenly, she became my caregiver. I appreciate her taking on this challenging responsibility more than she’ll ever know. For some ALS patients and their caregivers, the roles begin almost immediately. Ours was a slow creep. Over one year my ALS symptoms caused me to give up cooking, doing laundry, driving, and running errands by myself. Lauren stepped up and willingly took on the duties — even having to deal with a big learning curve, she has been here for me every step of the way. Believe me when I tell you, it’s no easy task. Emotionally and physically! The answer came in the form of giving a gift from my heart: being aware of my behaviors and of how small changes on my part can help her days to be less stressful. Living with ALS means there will be stressful events, changes in symptoms, and unexpected challenges. Emotions can ignite, and it’s easy to lash out and blame whoever is in close proximity. This happens way more than it needs to. When I’m lost in thought and not paying attention to what I’m doing, I’m at a greater risk of spilling, dropping, choking, or — worse yet — falling. These make Lauren’s job of caregiver much harder. Caregiving is a partnership between the giver and the receiver of care. Caregivers deserve our recognition and gratitude. So, I share a special “thank you” to ALS caregivers around the world. Together, we can learn to live well while living with ALS. This past Saturday I spoke at the annual ALS Conference at the Hospital for Special Care, New Britain, CT. I’ve been a patient at the ALS and Neuromuscular Clinic for the previous two years, and was honored when asked to speak about my own personal perspective on ALS. It felt right to be in front of so many other families that have been stricken with this awful diagnosis. It was very easy for me to open up and share my experience, strength and hope with all of these warriors, their families and caregivers. While I know each one of us goes through this journey differently, I can only hope those in the audience were able to identify with something in my journey. This is probably my fourth or fifth large speaking engagement, and I feel that I get as much out of doing them as everybody in the crowd seemed to. New Rock for Rich website is up and running! Thursday, October 11 is the inaugural Rock for Rich event! We have rented out Garcia’s at the Capitol Theatre from 5:30pm to 7:30pm before the Michael Franti & Spearhead concert for an EPIC pre-show fundraiser. If you can’t make it at all, please consider making a donation directly to either or both of these wonderful foundations through the donation links below. These donations will get added to our Rock for Rich fundraiser goal. Rock For Rich t-shirts will be available at the party, or on my website very soon. Help me to try and make a difference in this world as an advocate and an activist. 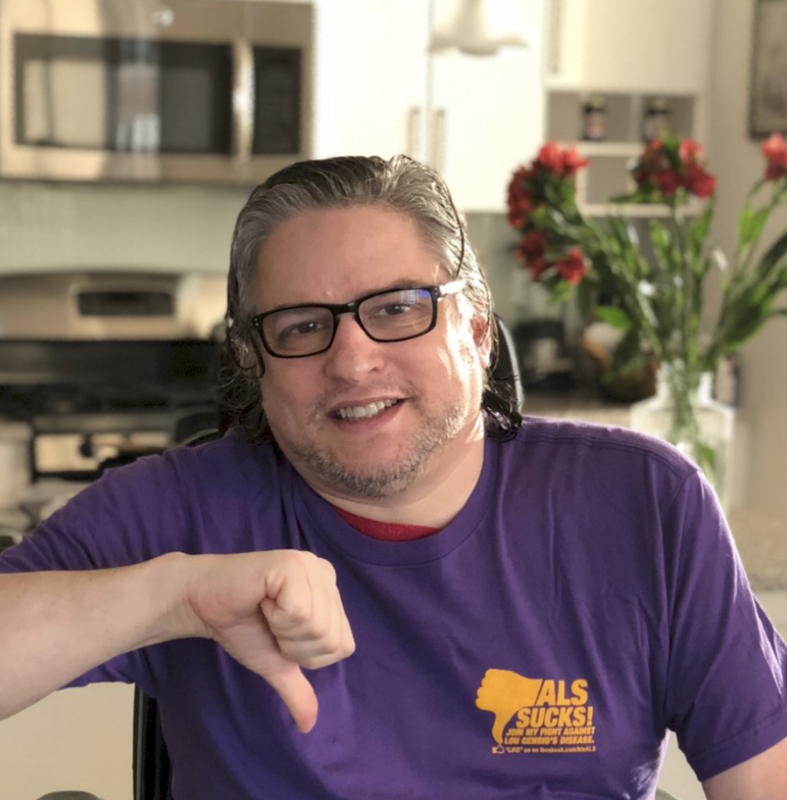 I came up with the idea of Rock for Rich to help people with ALS, and others with life-threatening illnesses, by coming together with music as the backdrop to raise funds and help increase the much-needed awareness for the ALS community. Let’s help ALS patients and their families directly and donate to research for a cure. A cure will come, I know it will. It may not be in my lifetime, but I’m here to help the people that come after me and to get something accomplished while I can help. Okay, my family and friends – please save the evening of October 11 for the inaugural Rock for Rich event! I cannot be more excited with what we have planned! As you know, live music has always been in my DNA, it helps to heal my soul and to dig deep for hope. So… here I am, starting to get my message out, and trying to make a difference in this world as an advocate and an activist. I came up with the idea of Rock for Rich to help people with ALS, and others with life-threatening illnesses, by coming together with music as the backdrop to raise funds and help increase the much-needed awareness for the ALS community. I am not asking for personal donations, I am asking for your help to support organizations that use donations to help ALS patients and their families directly, and to donate to research for a cure. A cure will come, I know it will. It may not be in my lifetime, but I’m here to help the people that come after me and to get something accomplished while I can help. So… here’s the fun part! I’m throwing a private pre-show bash on Oct 11 at Garcia’s in the Capitol Theatre, Port Chester New York. More info to come (hopefully this weekend) on all the logistics and where to purchase tickets. In the meantime, please save the date … I would really love to see all of you that can make it to my first Rock for Rich event! ***Update to this message: please don’t purchase any tix yet for the Franti concert. We will be selling tix for both the concert and the Rock for Rich pre party event. They will be available next week. Hold tight I promise they’ll be plenty tickets released through Rock for Rich. This past week a very special friend of mine lost her epic battle to a terminal disease. You see… my friend Heather and I had recently established a very special connection over the past couple of years in that we had a common bond in fighting our fiercest to live our lives to the fullest and never ever give up. Heather lost her battle to cancer last week. Leaving behind a wonderful family, husband and two precious girls. I wanted to share with you the post I left on her page because it really expresses my thoughts and feelings about what it means to connect with other people while you struggle within your own battles. Whatever they are. Today we mourn the Queen of soul. To her family, friends and so many people… Heather was a Queen of hope. Rich Lieberman’s post in memory of Heather Sabella. Heather was a light that shined so brightly, and will always be an inspiration to me as I continue to fight my battle to stay alive against ALS. The last time we spoke and I had the chance to give her a huge hug, we looked into each others eyes and promised to each other we were going to keep fighting until there was no fight left in us. Early on while I was fighting my own battle privately with my family, it was hard to share my story with friends and acquaintances far and wide. It was Heather’s courage and honesty in sharing her own battle with the rest of us, that helped me to gain the strength to finally come out and share my life-threatening illness. She explained how much relief and strength it could provide and I thanked her so much for such great advice. Our messages to each other when one of us posted something were truly heartwarming and very special. The day she passed I woke up feeling a sense of relief somehow. I started to write in my blog and share how lucky I was to be surrounded by such amazing family and friends. Before I had a chance to post it, I received a text message that she had passed peacefully that day. I want to believe that my peaceful feeling was a sense that she was finally free from the pain of her struggle. That very night I went to see Band of Horses at the Capitol Theatre. Some years ago, I saw her and Bill together at the Band of Horses show at the Cap. It was before all of our troubles began and when things were right in this world. We all danced and enjoyed the music, for it was music that was our connection from the beginning. Was this just a coincidence? I think not, I know not. I decided to go to the show in her honor, and say a prayer for her and her family, and to remember the times when we were both healthy. I now go to shows in my power wheelchair as a quadriplegic. Heather was not a quitter, I looked to her for strength and I still do. A wonderful person, friend, mother and wife. My heart goes out to Bill Ogg and the kids. She will always be with you. The universe has lost one of the really good ones. I had such a great day having cocktail hour on a gorgeous Friday Night in Stamford last night with Lauren. We sat outside, had some adult beverages while listening to an acoustic guitar player. It was so great to be out.. I think we might just make this our weekly Friday night ritual going forward. Also, was happy to run into an old boss from Apple as well. I’ll keep trying to ‘Live Like Lou’ everyday. I truly share the sentiment of those words and will try to channel his strength till the end. Very hard thing to do from a man so larger than life. This video is about Fathers Day and the emotion I felt today. It’s both beautiful and bitter sweet. Couldn’t find the streangth today to open myself up here in a personal video. But here’s a tribute to my Dad’s and me. Father & Son.